Arctic Comms for Warfighters: The connectivity required within a brutal environment and potential future conflict, By Dan Gager, Vice President of Business Development, COMSAT, Inc.
With melting ice exposing valuable natural resources and new trade routes, the Arctic has become the next economic frontier and the United States is in a race to strategically position itself to protect its interests in the region. Satellite communications (SATCOM) are an essential capability for U.S. military operations and missions. But they also present an attractive target, one that leaders believe adversaries may attempt to deny, degrade, and destroy in the future. Viasat collaborates closely with warfighters who are deployed around the globe to clearly understand the “problem to be solved” in customer terms, such as improved mission effectiveness and warfighter safety. X-band is designated by the International Telecommunications Union (ITU) as satellite communications spectrum in the frequency range of 7.25 GHz to 7.75 for space to Earth (receive) and 7.9 GHz to 8.4GHz for Earth to space (transmit). 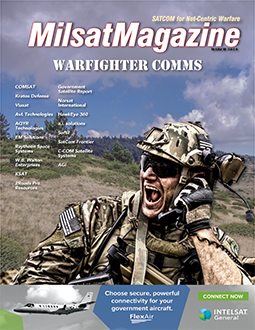 Though new technologies and services have the potential to provide more SATCOM bandwidth to the warfighter, deployed users continue to struggle with congested networks. In 1946, melted chocolate in the pocket of a Raytheon engineer led to the invention of the microwave oven, a technology whose core function and use has remained pretty much the same for decades. SATCOM-On-The-Move (SOTM) or SATCOM-On-the-Pause (SOTP) systems have proven to be effective tools for providing secure, beyond-light-of-sight communications on land for military troops in remote locations and “austere” tactical environments. The information management model of tasking, collection, processing, exploitation and dissemination (TCPED) deserves renewed attention in an era when the volume and value of information is expected to increase at exponential rates. During a meeting among masterminds in the United States defense industry in San Jose, California, several prime military contractors, educational and political leaders, sounded an alarm. Enhanced communications capability has always been the cornerstone of modern warfare and the key to any successful mission. Considering modern warfighter communications, the reality is soldiers are not bound to predetermined areas and fixed home bases for secure data transmission. John Serafini is the CEO of HawkEye 360, developer of space-based radio frequency (RF) mapping and analytics capabilities. He previously served as Senior Vice President of Allied Minds where he led the formation of and the investment into HawkEye 360, along with other Allied Minds companies such as BridgeSat, Federated Wireless, Optio Labs, Percipient Networks, and Whitewood Encryption Systems. A common ground system is seen by many in the space industry as a mechanism to recognize significant cost and schedule reduction for space missions. The time has arrived for public authorities and first responders to use 21st century technology to work smarter and better. At the end of 2018, division chief Clare Grason and her entire satellite communications team at the Defense Information Systems Agency moved over to work in the same capacity under General John (“Jay”) Raymond at the U.S. Air Force Space Command (AFSPC). Nearly 50 percent of the world’s population have no access to basic health services. The vast majority of this population live outside cities, in peri-urban areas, where few hospitals exist. Those of us who are well-connected within the space community hear the continuous drum beat of adversaries improving their organic space capabilities, closing the gap of the United States’ competitive advantage in the domain.